Paul Nixon: Leicestershire head coach says players need "a bit of love"
New Leicestershire head coach Paul Nixon says improving communication and showing the players "a bit of love" will be key to raising standards after a dismal season. The club finished bottom of County Championship Division Two, failing to win any of their 14 matches. But ex-Foxes and England wicketkeeper Nixon told BBC Radio Leicester the club have the talent and passion to succeed. "I need to get to know the players as people, not just as players," he said. "It is very much a holistic approach because we live in a big brother house for six months, so it's about communication with our own people and knowing them on a deeper level. "I think a lot of the guys just need a little bit of love and a little bit of focus and energy." 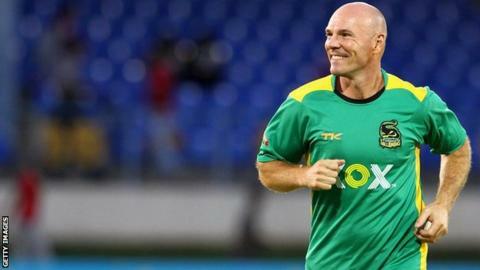 Nixon twice won the Caribbean Premier League as coach of Jamaica Tallawahs and has replaced Pierre de Bruyn, who left after just one year in charge. "It's been tough for the players," the 46-year-old said. "They have had a few different managers and coaches. It's about gaining that trust and having really good communication throughout the whole system and I think we have been lacking that a little bit." Nixon retired as a player in 2011 after winning two County Championships and three Twenty20 titles with Leicestershire, having spent his entire career at Grace Road, apart from a two-year spell with Kent. "I came up through the system and Leicestershire gave me the opportunity," Nixon said. "We have to get our foundations right and produce more England players again. All these kids like James Taylor, Stuart Broad, Harry Gurney, Darren Maddy, Ben Smith and Paul Nixon had a great grounding at junior level with the club. "I had a bit of time out of the game and when I came back into coaching I really enjoyed it. "As a senior player you are always doing a bit of coaching but I really learned how to coach at the ECB going through the various levels and it something I am passionate about."